The Rio Grande flowing through the Colorado town of Del Norte. Working collaboratively with locally-led groups is the best path forward to reduce conflict and develop solutions that will lead to the long-term viability of watersheds. Bureau of Reclamation Commissioner Brenda Burman announced that 27 entities were selected to receive a total of $2.6 million to establish or further develop watershed groups in order to address water quantity or quality through Cooperative Watershed Management Program Grants. Of the 27 entities selected, 19 are existing watershed groups, including one from the Virgin Islands, and 8 are establishing a new watershed group. "Reducing conflict over water is an important goal," Commissioner Burman said. "Working collaboratively with locally-led groups is the best path forward to reduce conflict and develop solutions that will lead to the long-term viability of watersheds." Selected entities may use their funding to develop bylaws, a mission statement, complete stakeholder outreach, develop a watershed restoration plan, and to conduct watershed management project design. A complete list of the selected projects is available at https://www.usbr.gov/watersmart/cwmp. 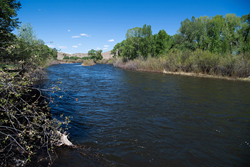 The Save Our Bosque Task Force in Socorro, New Mexico, is one of the groups selected to receive funding. It will receive $100,000 to update their 2004 conceptual restoration plan on the Rio Grande floodplain through Socorro County where flooding can devastate farms, infrastructure and small communities. Recent drought conditions have limited available surface water supplies in the watershed, increasing wildfire risk and reliance on groundwater, which also strains aquifers. The task force will work with the Middle Rio Grande Conservancy District, New Mexico State Forestry and numerous other local, state and federal agencies to complete outreach to stakeholders. The Coral Bay Community Council on the island of St. John in the U.S. Virgin Islands will receive $99,155 to complete a five-year update to its watershed management plan and develop a visioning document for the Coral Bay Watershed. The group has spent a significant amount of time characterizing source pollution into Coral Bay, including unmanaged stormwater, sediment transport and an inadequate solid waste system. In addition, back-to-back hurricanes in 2017 have increased the need for updated planning efforts. The council will hold stakeholder meetings to help inform the public of the importance of watershed planning and to incorporate diverse perspectives in the updated plan and visioning document.